At a recent meeting, scientists shared ideas for searching for dark matter on the (relative) cheap. Thirty-one years ago, scientists made their first attempt to find dark matter with a particle detector in a South Dakota mine. Since then, researchers have uncovered enough clues to think dark matter makes up approximately 26.8 percent of all the matter and energy in the universe. They think it forms a sort of gravitational scaffolding for the galaxies and galaxy clusters our telescopes do reveal, shaping the structure of our universe while remaining unseen. These conclusions are based on indirect evidence such as the behavior of galaxies and galaxy clusters. Direct detection experiments—ones designed to actually sense a dark matter particle pinging off the nucleus of an atom—have yet to find what they’re looking for. Nor has dark matter been seen at the Large Hadron Collider. That invisible, enigmatic material, that Greta Garbo of particle physics, still wants to be alone. It could be that researchers are just looking in the wrong place. Much of the search for dark matter has focused on particles called WIMPs, weakly interacting massive particles. But interest in WIMP alternatives has been growing, prompting the development of a variety of small-scale research projects to investigate some of the most promising prospects. In March more than 100 scientists met at the University of Maryland for “Cosmic Visions: New Ideas in Dark Matter,” a gathering to take the pulse of the post-WIMP dark matter landscape for the Department of Energy. That pulse was surprisingly strong. Organizers recently published a white paper detailing the results. The conference came about partly because, “it seemed a good time to get everyone together to see what each experiment was doing, where they reinforced each other and where they did something new,” says Natalia Toro, a theorist at SLAC National Accelerator Laboratory and a member of the Cosmic Visions Scientific Advisory Committee. What she and many other participants didn’t expect, Toro says, was just how many good ideas would be presented. Almost 50 experiments in various stages of development were presented during three days of talks, and a similar number of potential experiments were discussed. Some of the experiments presented would be designed to look for dark matter particles that are lighter than traditional WIMPs, or for the new fundamental forces through which such particles could interact. Others would look for oscillating forces produced by dark matter particles trillions of times lighter than the electron. Still others would look for different dark matter candidates, such as primordial black holes. The scientists at the workshop were surprised by how small and relatively inexpensive many of the experiments could be, says Philip Schuster, a particle theorist at SLAC National Accelerator Laboratory. “‘Small’ and ‘inexpensive’ depend on what technology you’re using, of course,” Schuster says. DOE is prepared to provide funding to the tune of $10 million (still a fraction of the cost of a current WIMP experiment), and many of the experiments could cost in the $1 to $2 million range. Several factors work together to lessen the cost. For example, advances in detector technology and quantum sensors have made technology cheaper. Then there are small detectors that can be placed at already-existing large facilities like the Heavy Photon Search, a dark-sector search at Jefferson Lab. “It’s basically a table-top detector, as opposed to CMS and ATLAS at the Large Hadron Collider, which took years to build and weigh as much as a battleship,” Schuster says. Experimentalist Joe Incandela of the University of California, Santa Barbara and one of the coordinators of the Cosmic Visions effort, has a simple explanation for this current explosion of ideas. “There’s a good synergy between the technology and interest in dark matter,” he says. Incandela says he is feeling the synergy himself. He is a former spokesperson for CMS, a battleship-class experiment in which he continues to play an active role while also developing the Light Dark Matter Experiment, which would use a high-resolution silicon-based calorimeter that he originally helped develop for CMS to search for an alternative to WIMPs. 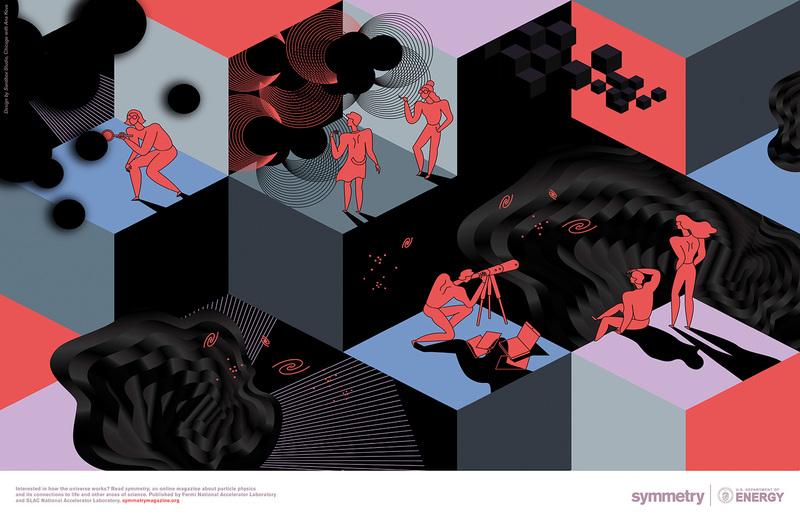 Check out our printable poster about the expanding search for dark matter. Some theorists have taken to designing their own experiments to broaden the search for dark matter. The story of the latest experiment approved for installation at the Large Hadron Collider starts with a theorist and a question about dark matter. Fermilab scientists are harnessing quantum technology in the search for dark matter. SuperCDMS physicists are testing a way to amp up dark matter vibrations to help them search for lighter particles. The SuperCDMS SNOLAB project is expanding the hunt for dark matter to particles with properties not accessible to any other experiment. Scientists on the Axion Dark Matter Experiment have demonstrated technology that could lead to the discovery of theoretical light dark matter particles called axions. A hidden world of particles awaits.